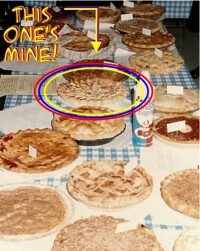 I entered an apple pie in the State Fair of Texas! To read about my experience follow this link: http://www.rattlingaroundinmyhead.com/humor/60/a-fair-to-remember.html Then come back here and try the recipe for yourself! Sift 2 2/3 C All Purpose Flour into a bowl, along with 1 t. Salt. Using a pastry cutter – or if you don’t have one, two regular kitchen knives scraped against each other – cut 1 C of very cold shortening (I keep mine in the fridge) into the flour until it is about the size of small peas. It should almost hold together a little bit when you mash a handful of it. Stir in about 7-8 T of very cold water with a fork and mix it into the flour just until there is no powdery flour left in the bowl. With your hands gently bring it all together into a ball, without working it too much. Pat it into a round disk, wrap it in plastic wrap and chill while you prepare the apples. Peel, core and slice about 8 large apples. Use a firm apple, but personally I don’t use Granny Smith because they are a bit too tart for my taste. (If you read my article "A Fair to Remember” this is where I lost my head and cut my apple slices into star shapes. Do NOT try this at home!) In a large bowl mix apples with 1 C sugar, ½ C flour, 1 t. cinnamon, 1 t. salt, and a pinch of nutmeg. Divide the chilled dough in half. Roll it out until it’s about 3” larger in diameter than your pie plate. Hint: Rather than worrying about using enough flour to keep it from sticking to the counter, I roll mine out onto two pieces of overlapping Saran wrap, lightly floured. I even place Saran on top of the dough while I’m rolling. That way I don’t work in too much flour and it’s easy to transfer the dough to the pie plate. I simply peel off the Saran wrap! Place the rolled-out dough into the bottom of a pie plate. "Dock” it with a fork (prick the bottom all over, so the crust won’t bubble up as it bakes.) Pour your apples into the plate. Roll out the other half of the dough. For a cherry pie I cut lattice strips and weave them together. However there isn’t enough color contrast with an apple pie to justify this, so I prefer a solid crust, unless I’m flirting with insanity and decide to cut out a billion tiny star shapes to place in centrifugal circles. Sometimes it happens. What can I say? After rolling out the top crust and laying it over the apples, trim the excess away to about a 1” overhang. Roll the top dough slightly under the bottom dough and crimp them together. "Flute” the edge by pushing down on the dough with your left thumb and index finger as you push back up against it with your right index finger. I like to roll out any excess dough and cut out a pretty shape (an apple, or leaves for fall, etc.) Brush a tiny bit of water onto the back of the cutout and press it lightly onto the top crust. Brush the top crust (but not the edges) with an egg wash – 1 egg mixed with 1 T. milk. Sprinkle the top with additional sugar and cinnamon. Bake at 375 for about 50 minutes, or until the crust is golden brown. Enjoy the aroma of freshly baked apple pie as it fills your house! Then dig in! Search for Desserts articles similar to "Apple Pie. Search all articles similar to "Apple Pie".